Should I use this warped firewall plywood? 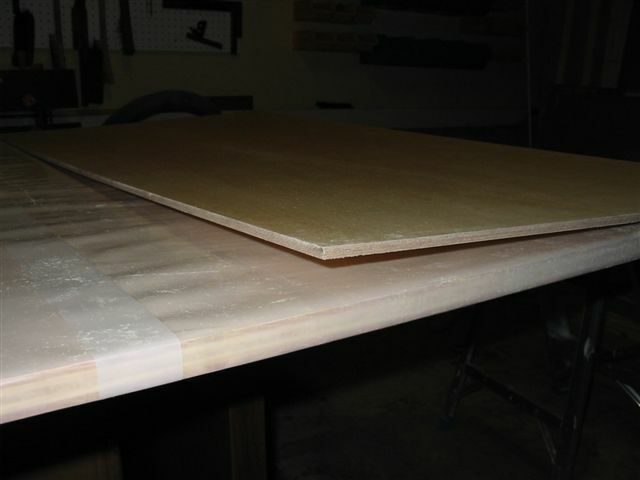 I found the firewall plywood I received from Wicks not to be what I expected -- aircraft-grade flat. Instead, it's warped into an odd concave shape (see attached). When sitting on one side, two far corners lift by 3/4". When flipped on the other side, the shorter edges lift in the middle by 1/8". I am thinking that when I cut the plywood longways it will relieve some of this tension. Also, it doesn't take much weight at all to push the piece down flat when on the one side. That being the case, I am thinking to leave it as-is, glass, and let cure with some weight on the top. I would give Wicks a call. I should have taken that bet. I was passed to "Don the Wood Guy" who explained to me, "plywood will warp if there is any humidity around -- it's a fact of life with plywood." Knowing that it has been raining on and off for the past few weeks, I couldn't argue with that. It's also a relatively small warp, so I'm not worried about being able to get it to cure flat. I live in Florida. It's a state where 9 months out of the year you need a snorkle to walk the dog. I've never had a piece of firewall board warp on me. I have some still in my workshop unglassed. I'll check it tonight for warpage. My suggestion: If you can't get it to cure reasonably straight, send it back for replacement. You paid top dollar for that stuff, and it's not your fault if they let it get wet. Also, if you keep it, glass it on the convex side. That way, you can weight it for flat cure. Now that I think of it, I may have had to do that very thing. But, my my warpage was minimal, if at all. Over $37 for a 2' x 4' sheet. I rationalized that into $0.03 per square inch -- cheap! Thanks Jerry, I'll do just that -- concave side down and glass the convex side with weights. Return the plywood and ask for replacement! One ply BID on both sides will not be enough to unwarp the plywood. Like others have said, you pay top dollar for flat plywood. Get your moeny's worth. Send it back. I talked with Jon Matcho about the warp and he is going to try and press it flat with a little water and weight. If that does not work Wicks will replace the plywood. The warpage essentially went away after that. I haven't actually glassed the permanent firewall yet as I've been waiting to verify the setup of my modified/widened firewall. I plan on doing it this weekend and will re-check the plywood. In hindsight, unless it's "violently" warped, I really don't think it's a big deal to have a small amount of warp. Clamp, flox, and tape (or whatever the firewall mounting procedure is), and it will be fine. When I'm fininished, years from now with my plane flying crooked, I can blame it on that piece of warped plywood. Airfoil hotwire templates off by 1/4"
The last of my worries with all of this is whether anything in the first list happened. The second list is where you need to take care to be "exact". Do that (build according to plans) and you'll be straight and true. Great! I appreciate the challenge to get my firewall done. I plan on doing it this weekend and will re-check the plywood. I'll wait to here from you to see if your piece is now flat before proceeding. I didn't get to building the firewall this weekend -- mounting my landing gear did happen though -- but I did verify the plywood is still flat. It has been sitting horizontal for over 2 years , so I'm sure that helps (storing it the way it's supposed to be). Yeah, I saw your posts. I happened to let mine stay flat for more than a weekend though, not entirely on purpose. Also keep in mind that you don't *need* to make the permanent firewall until Chapter 6.